The best map to use while in Arizona and New Mexico is the AAA "Indian Country" map. 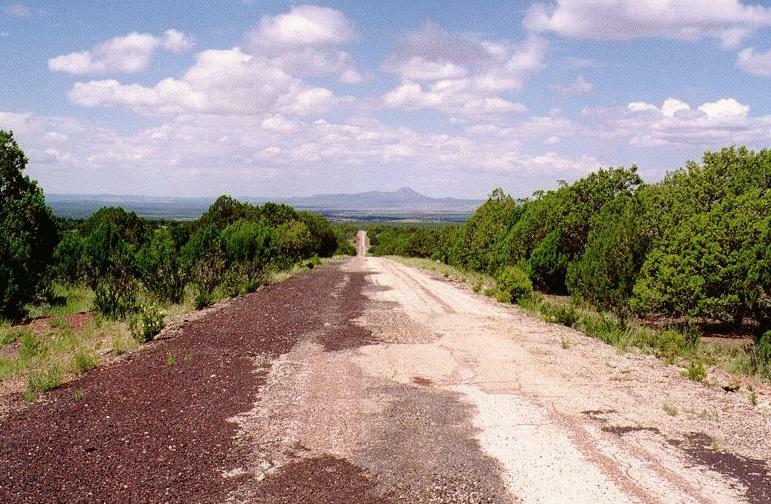 It is much more detailed than other road maps, even the AAA Arizona-New Mexico road map. It covers the entire length of the old highway (showing drivable remaining sections) from Cline's Corners in New Mexico (just east of Albuquerque) to just south of Kingman, Arizona. If you want to find absolutely every old section of the road then you will want 7.5' topographic maps published by the U.S. Coast and Geodetic Survey. These are large scale maps (meaning they cover very small areas) and at $7.50 per map you will spend a very large amount of money to get coverage of all of the old roadbed. A less espensive, though less detailed alternative is a series of books published by DeLorme called "Gazetteers". There is one Gazetteer per state and they cost $16.95 apiece. They contain 1:250,000 scale topo maps and clearly show the hard to find sections of old route 66. They even have GPS grids superimposed on the maps. To help in navigating the old road, I have begun to include GPS data in the form of Latitude and Longitude information for each photo I have taken along the route. 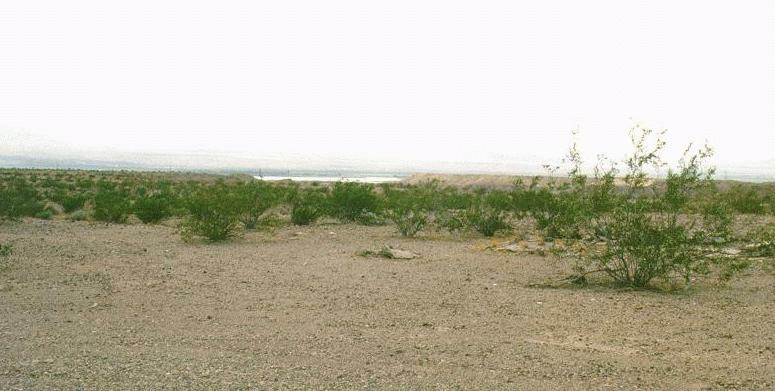 The Latitude and Longitude listed is where I was standing when I took the photo, usually in the middle of old Route 66. It is possible to store these Latitude and Longitude pairs as waypoints in your GPS receiver and then have the GPS receiver give you steering information to that waypoint. This is especially helpful for the older alignments. 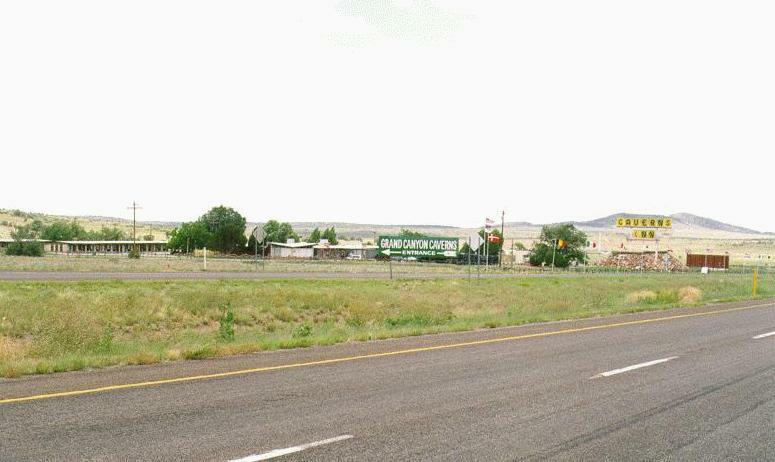 NM 118 enters Arizona from Gallup, New Mexico. Follow this road to Lupton. Then follow the road marked "Frontage Road". 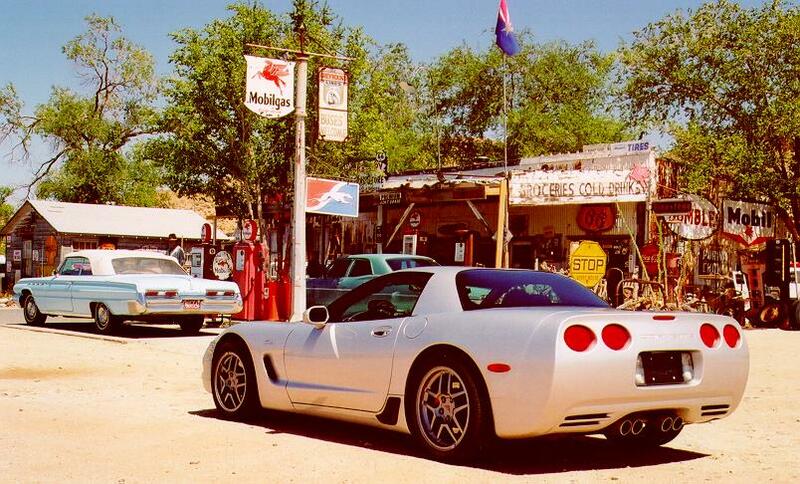 This is Route 66. You can stay on this stretch until I-40 exit 351, near Allentown, where you must either rejoin the interstate or cross under I-40 to follow the old route. Make a left after crossing under I-40. This stretch will take you to Houck. 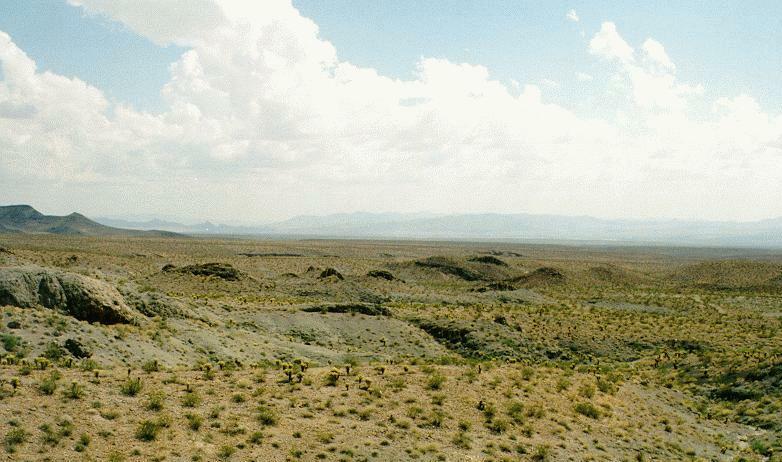 Take exit 311 to enter Petrified Forest National Park. The park is worth a detour assuming you have time and there is sufficient daylight to see the rainbow colors of the rocks. The road through the park is very narrow, so pay attention to your driving. You can stop frequently to peep rocks. Follow the road as it exits the park. This is an older alignment that leads to Holbrook. A later alignment followed what is now I-40. 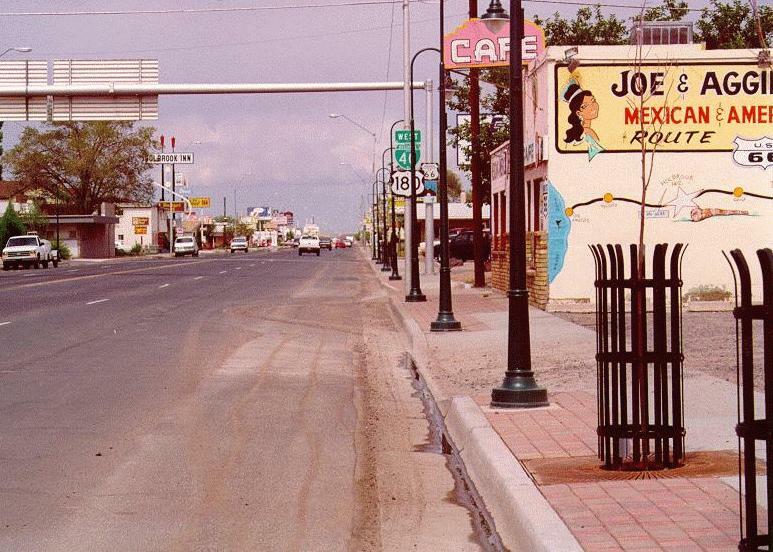 Hopi Boulevard is old Route 66 in Holbrook. To get to it from I-40 use exit 289. 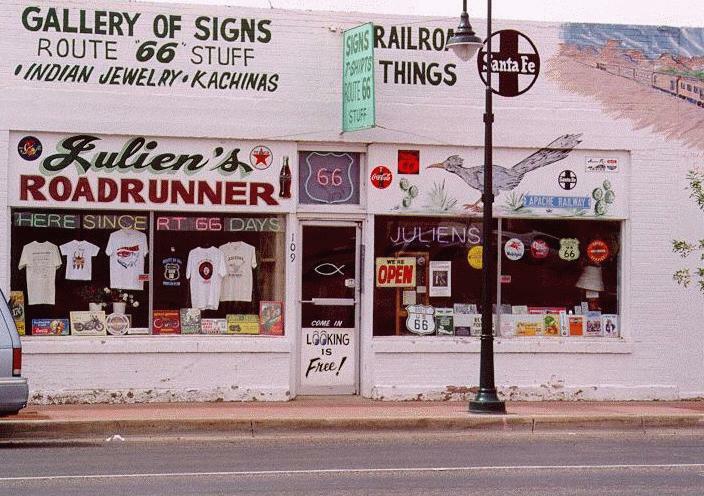 One of the coolest Route 66 haunts is Julien's Roadrunner at 109 W. Hopi Drive. 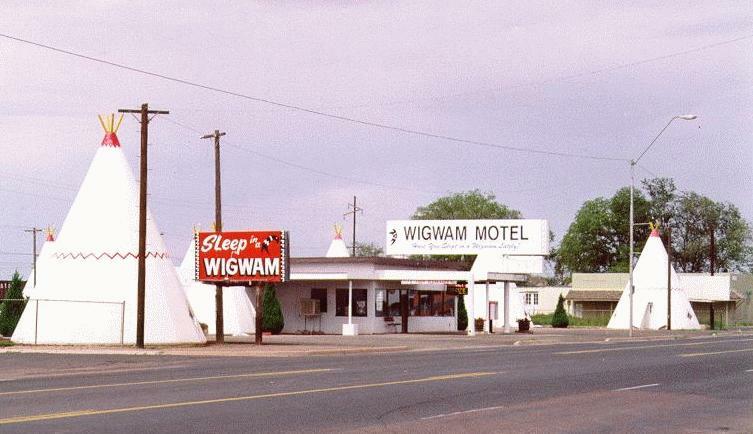 Further down Hopi Drive is the famous Wigwam Motel. Enter I-40 at exit 285 to continue to Joseph City. 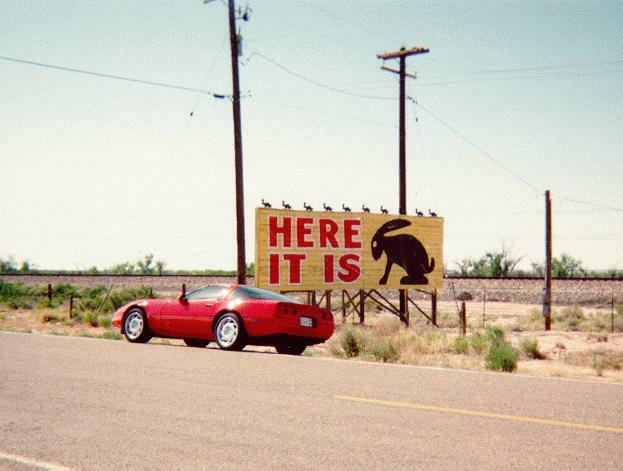 Take exit 277 to enter Joseph City to visit the famous Jackrabbit. The Jackrabbit store is actually west of town. 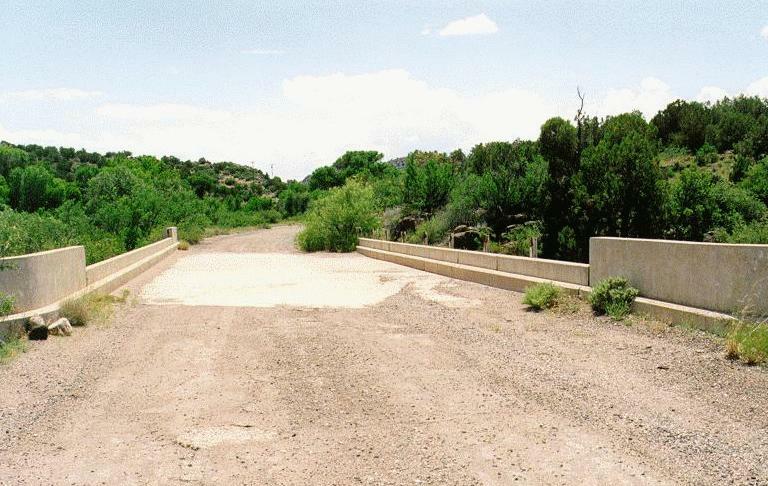 It is on the old alignment of the road which is on the south side of I-40, between the interstate and the Santa Fe roadbed. You will see the famous Here It Is sign on the south side of the road. Rejoin I-40 at exit 274 to continue west. Take I-40 exit 255 to enter Winslow. The first thing you see entering Winslow from the east is a Whiting Bros Gas Station. It can be reached from both the eastbound and westbound parts of Route 66. The station was open for business in 1996, but as of August 11, 2001 it was closed and boarded-up. This is another town where Route 66 was split into east-bound and west-bound sections, usually with a block between containing businesses. The east-bound section in Winslow is the more interesting part. 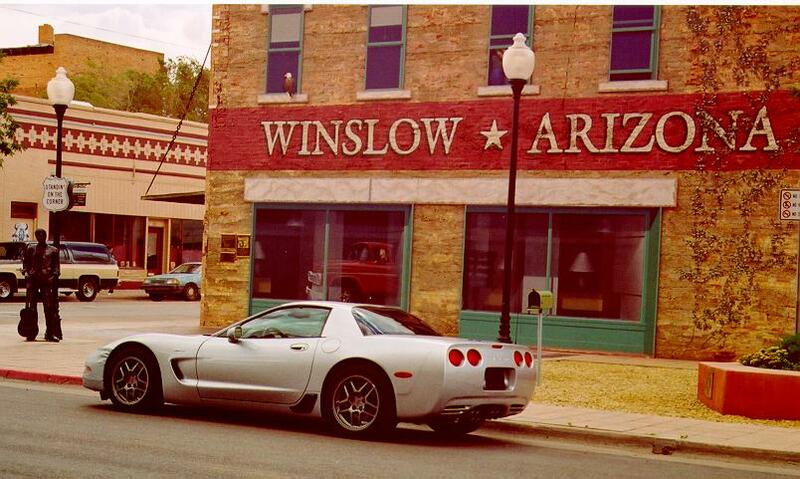 The Eagles made famous the lyric "I was standin' on a corner in Winslow, Arizona...". 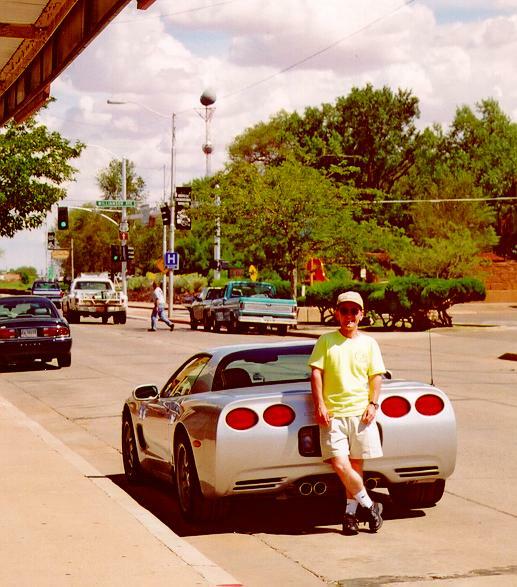 Here's a photo of me standin' on the corner in Winslow. This is the eastbound side of the road.That's a park across the street. 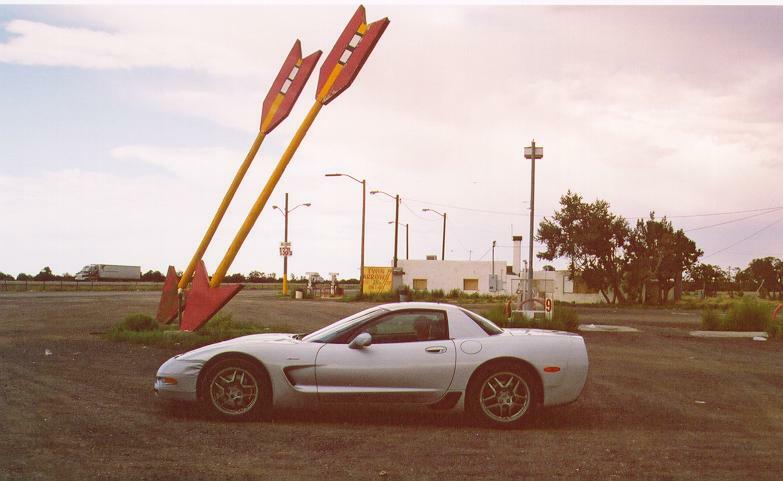 Here is another taken with my Z06 on the same corner. They now have a statue of a man standing on the corner in a small park recognizing the Eagle's contibution to Winslow's fame. The park is on Kinseley Avenue. 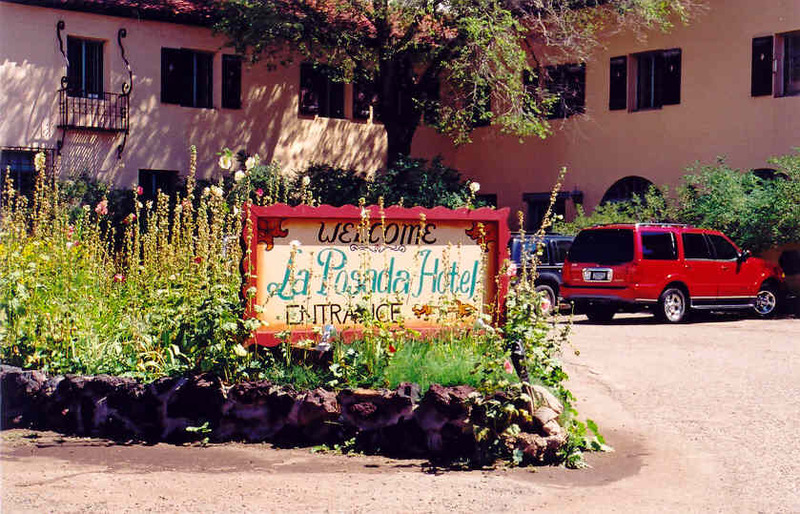 The Fred Harvey La Posada Hotel, of Santa Fe Railroad fame, has been restored and is open for business. The restaurant has been restored as well. 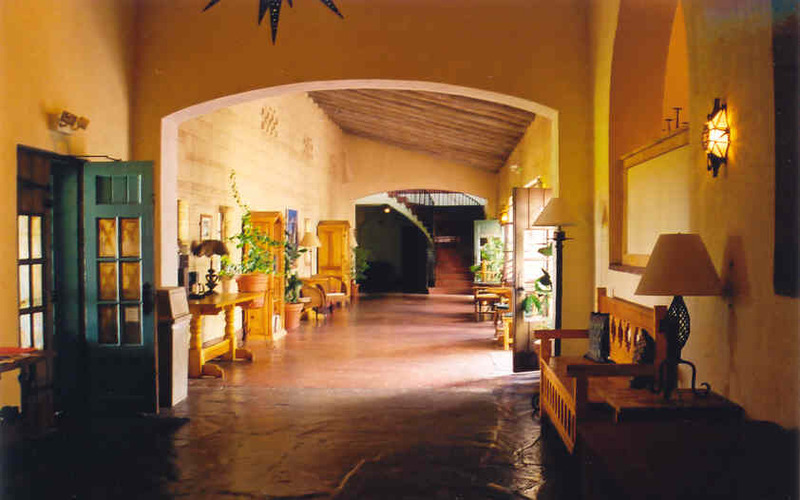 The lobby area is very attractive. The view from the Santa Fe Railroad platform is quite impressive. Rejoin I-40 at exit 252. This is several miles south of I-40 and worth a detour. This is a privately owned facility and not part of the National Parks system. However, the museum is fairly informative and the hike out to the crater itself is entertaining and educational. The crater is huge and was actually the site of a mining venture. You can still see remnants of the mining equipment in the center of the crater, and along the rim. 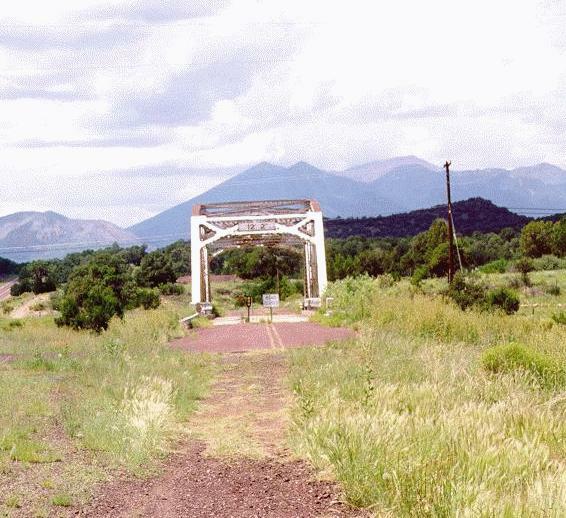 From the visitor center you can see the San Francisco Peaks north of Flagstaff in the distance. Enter I-40 at exit 233 to continue on to Winona. Take exit 230 and drive through Two Guns, Arizona. 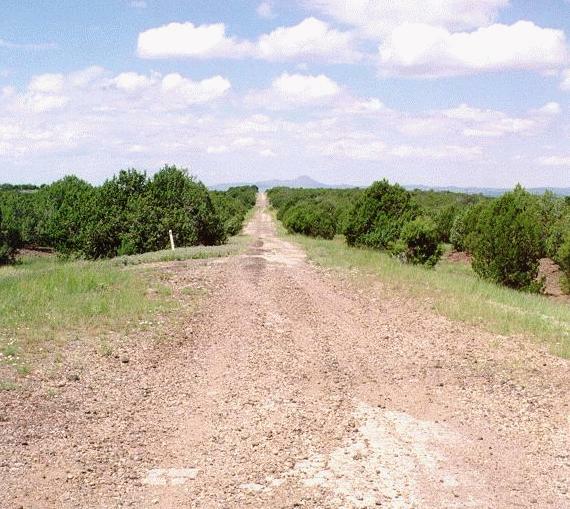 Here you will find an old section of the road that heads southwest out of town and ends after a few miles. Rejoin the interstate at exit 230. Take exit 219 to visit Twin Arrows. The parking lot is usually filled with tractor trailers, their drivers catching a nap. Return to I-40. You will pass an old section of the road staring just east of exit 211, on the north side of I-40. It continues west until exit 211. Take exit 211 to enter Winona. At the stop sign turn right. On your right you will see an old section of the road which has been abandoned but is still drivable. If you continue west on the paved section you will see a mining operation on your right. Continue westward on the road and you will get a view of the San Francisco Peaks beyond Flagstaff (from N 35° 12.488' W 111° 24.779). Driving further west you will come upon an iron truss bridge that carried Route 66 in the 1940's (N 35° 12.682' W 111° 25.214'). 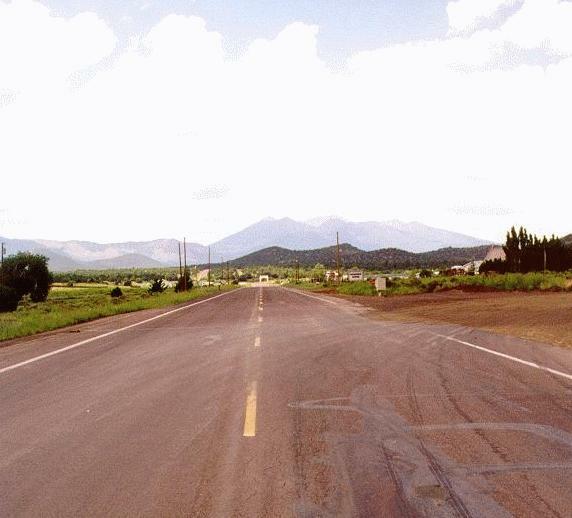 As you approach Flagstaff you get a great view of the San Francisco Peaks. 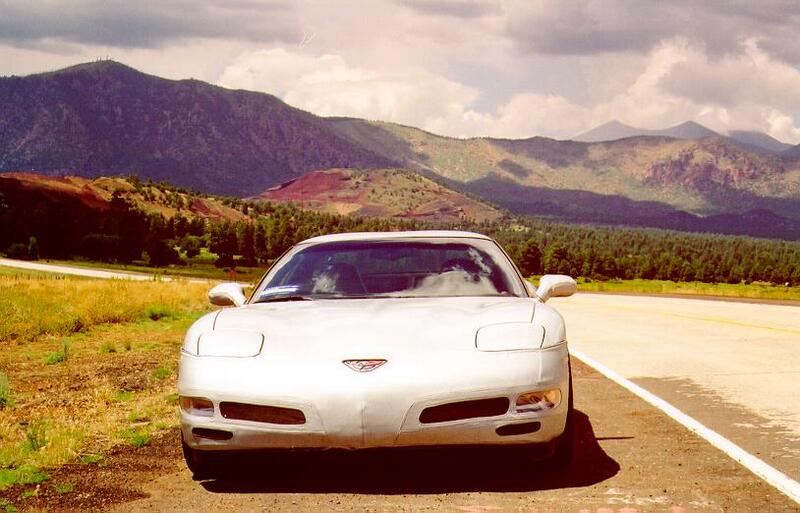 Follow old Route 66 until it becomes Santa Fe Avenue and enters Flagstaff. Turn left onto Beaver Street, then right on Phoenix Avenue to Milton Road where you turn left. Follow Milton Road to I-40 to continue west. Flagstaff itself is an odd town. It does not seem to have a center. It sort of follows the railroad roadbed. 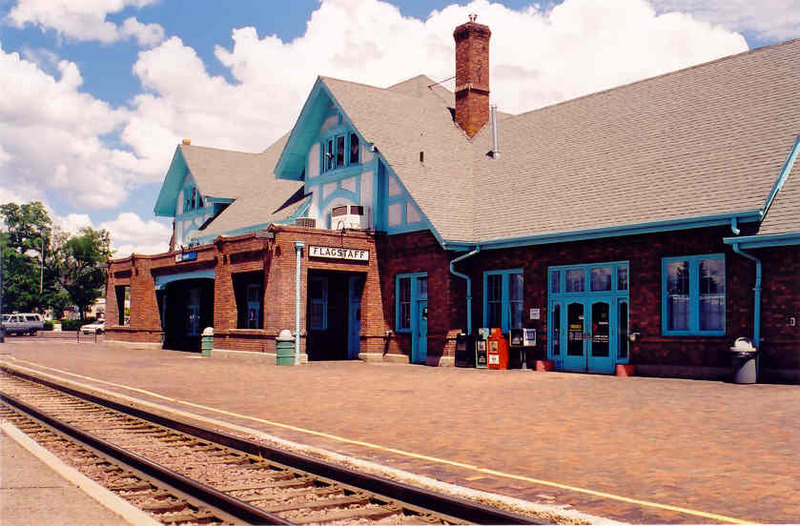 The train station is on Santa Fe Avenue. There are some interesting places to see if you have the time. The Lowell Observatory is here as are many museums. The forests get thicker as you leave Flagstaff. One of the nicest rest stops you will ever find is along this stretch of I-40, nestled among some very tall pine trees. Enjoy this while you can, as once you leave Peach Springs, trees will be few and far between until west of the town of San Bernardino, California. Take the Parks Road exit, number 178. The pavement ends at N 35° 16.245' W 111° 53.330' Elev 7279 feet and you pass by a barn and stock pen. The pavement resumes at N 35° 15.544' W 111° 55.909' and you pass a Union 76 station at Spring Valley Road. The road surface changes from concrete to asphalt as the road veers south to parallel I-40. 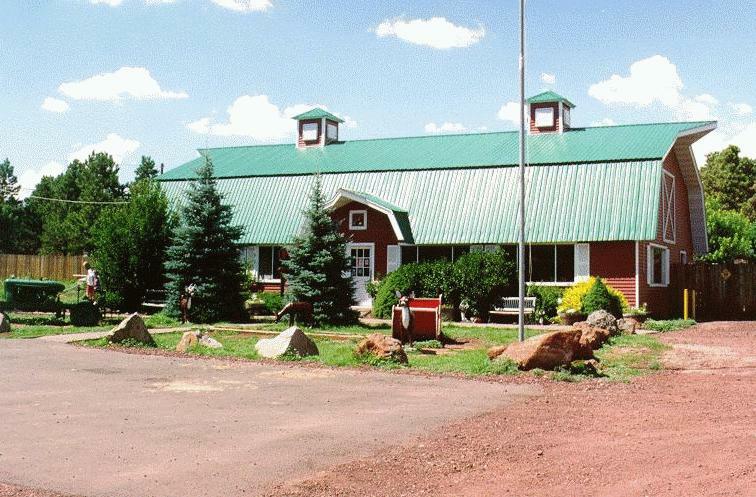 The old road passes the Deer Farm, which is a petting zoo filled with many species of deer, llamas, reindeer, burros, exotic birds, and other animals. You can, for a fee, walk through the farm petting and feeding the animals, which are quite tame and very insistant on being hand fed. 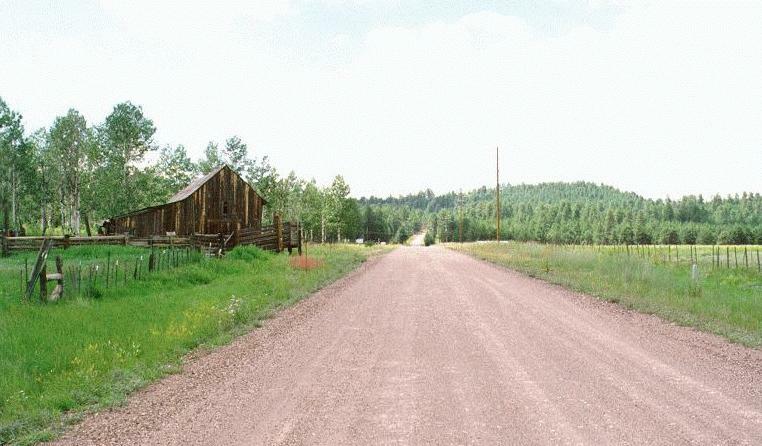 At this point you can either rejoin I-40 at the Deer Farm Road exit (number 171) to continue to Williams, or continue west on an unpaved stretch of the old road at N 35° 15.949' W 112° 04.110'. The pavement resumes at N 35° 15.519' W 112° 06.690'. This stretch is now referred to on maps as FR 146 (Fireroad 146). Rejoin I-40 at exit 167. Take exit 165 to get to the start of the westbound side of the old highway in Williams. Again, Route 66 ran on each side of this town, and the westbound side is one-way. The eastbound side of the old road is where most of the businesses are located, including motels and restaurants. Williams is at a higher elevation than the previous towns along the route. It gets more snow and therefore more meltwater, so there are abundant stands of evergreen trees. It is generally cooler here than it is farther west. Williams is actually a fairly good sized town. 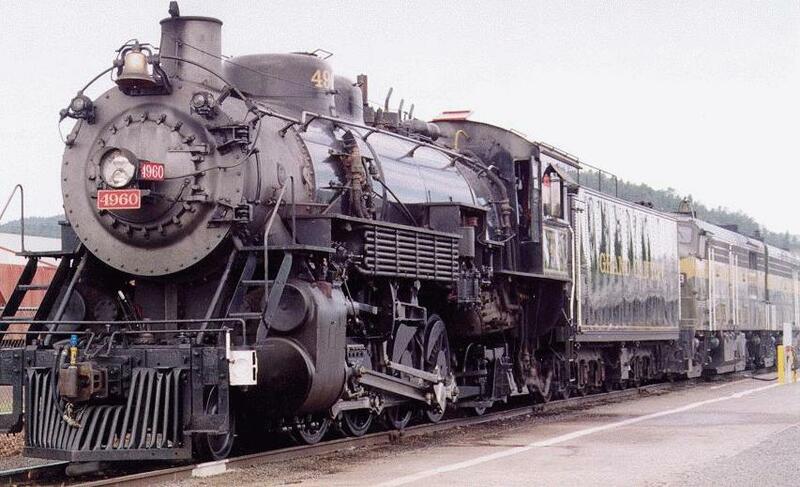 Its main attraction is the train to the Grand Canyon pulled by steam locomotives. Main street is old Route 66, and there are lots of structures that were constructed during the road's heyday. If you have the time to visit the Grand Canyon, take the train. Parking at the South Rim is difficult to non-existant, and the road to the canyon, US 180, is choked with RVs, pickups with overloaded camper shells, and rubber-neckers. Take the train. It's a nostalgic experience, and you don't have to worry about parking. One note: when they blow the whistle for the return trip, get back on the train. If you don't it's a long walk back to Williams. 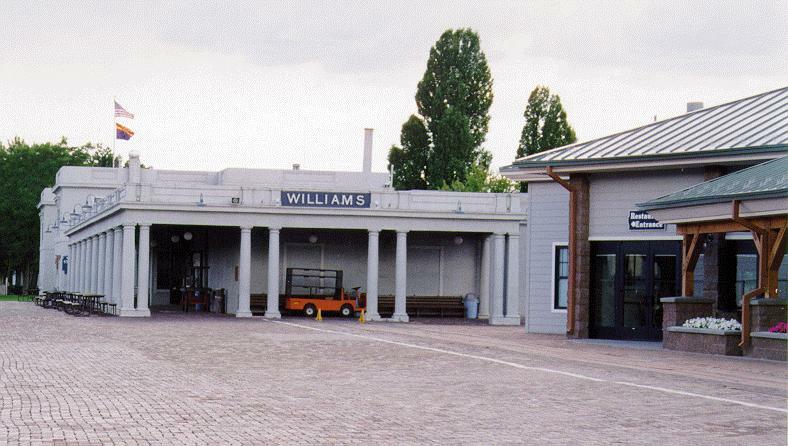 The train leaves Williams station at about 10:00 AM and arrives at the Grand Canyon at 11:15 AM. The train leaves the Grand Canyon at 3:30 PM and arrives in Williams at 5:45 PM. Make advanced reservations as the train is almost always booked solid. Railroad buffs might be intersted to discover that the train is actually pulled by old number 4960, a 2-8-2 Baldwin Locomotive Works steam engine built in Philadelphia, PA in August of 1923. 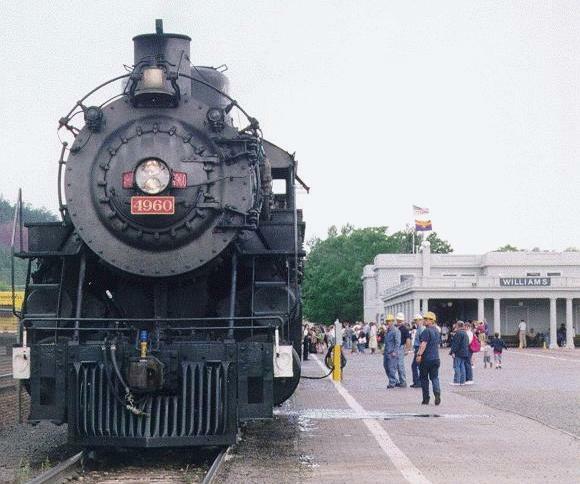 Additional motive power is provided during the summer months (Memorial Day to Labor Day) when trains are longer by two diesel engines, (visible behind the steam engine). 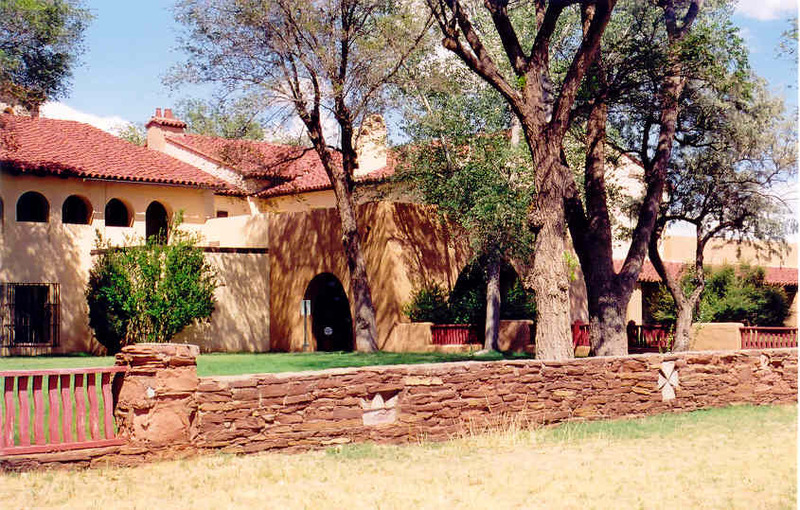 In addition to the train, the Fred Harvey Frey Marcos hotel has also been restored. If it fits your schedule, try to overnight in Williams. 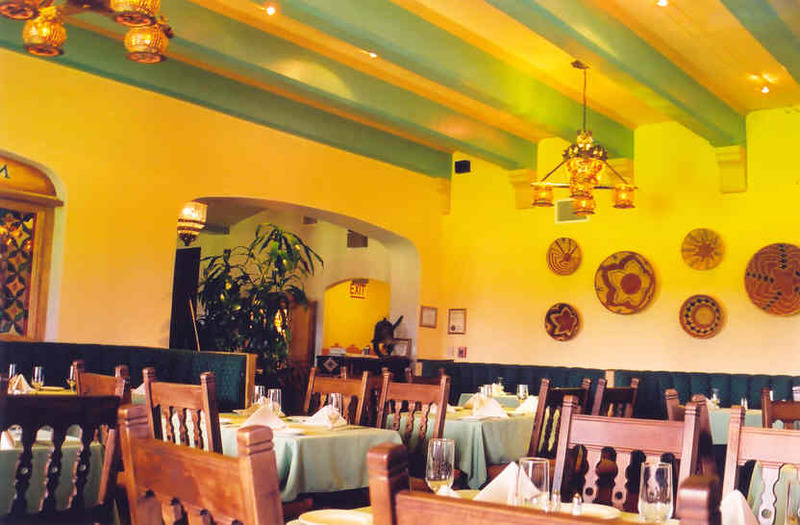 It has excellent accomodations in all price ranges, and a number of fine restaurants including Rod's Steakhouse at 301 E. Route 66. Williams is a clean place, and it smells of pine trees. It's one of those towns where you park the car and walk around, pretty much without a care in the world. Williams is one giant Route 66 gift shop. 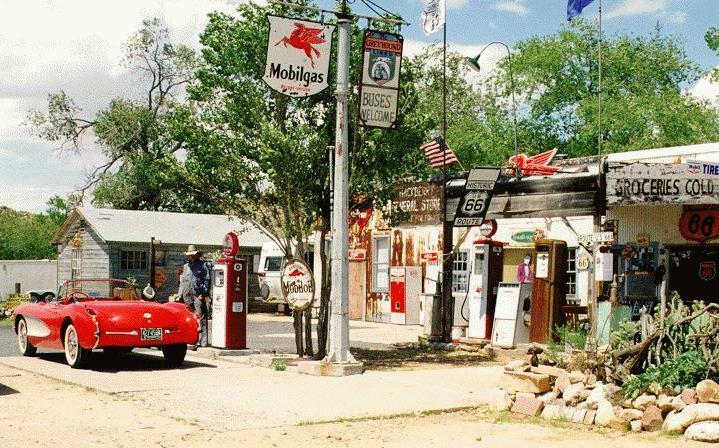 Every establishment, including motels, restaurants, and gas stations, sells Route 66 memorabilia. 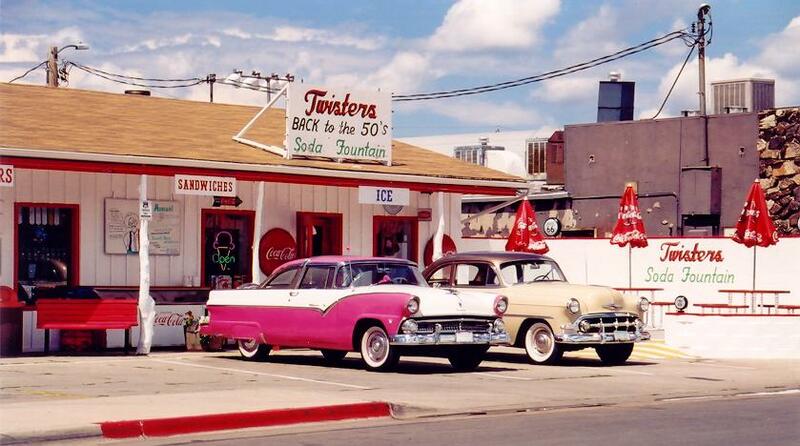 The two best places to drop your money are the Route 66 Publishing Company and The Route 66 Place, which includes Twisters, a 1950's style soda fountain where you can get real milkshakes and root beer floats. The Route 66 Place also boasts the largest selection of Coca Cola memorabilia west of Coca Cola headquarters. This was the last stretch of I-40 to be completed. 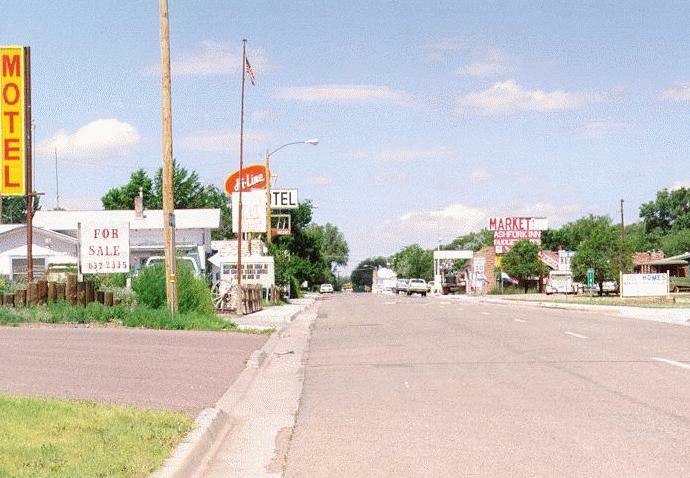 The town was bypassed in 1984, and Route 66 was officially decommisioned as a federal highway. 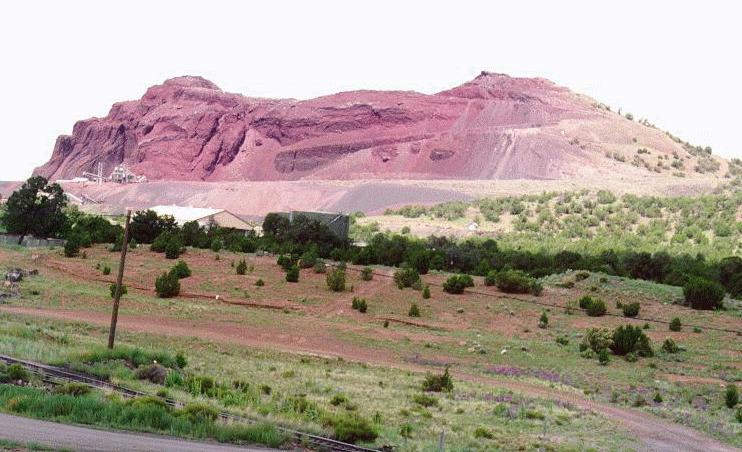 After leaving Williams you pass by Bill Williams Mountain on the south side of the highway. Take exit #151, Welch Road, to find a barely drivable section of the 1932 alignment of the old highway. At the end of the exit road you will see a red gravel road to the right. Take this road. You will come to a sign erected for a bicycle tour of Route 66. It has a small map showing the 1922 alignment (undrivable) and the 1932 alignment. Continue to the right until you come to a "Y" junction. Go left and see this view of the road at N 35° 13.380' W 112° 22.110'. This section of the 1932 alignment at N 35° 13.347' W 112° 23.384' continues for approximately 3 miles and ends at the Monte Carlo exit of I-40 where you must rejoin the interstate to proceed to Ash Fork. When you arrive at the Monte Carlo end you will find the road is blocked by a barb wire fence. There is a hole in the fence if you drive a few yards to the south. This road is not recommended for vehicles that do not have high clearance. The asphalt is in very bad condition and the road is very bumpy. Rejoin I-40 and take exit 146 to enter Ash Fork. Old Route 66 runs north of I-40 here. 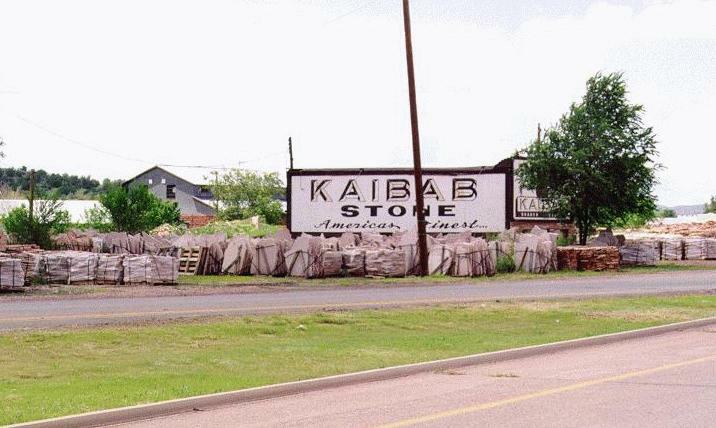 There is not much in "town", but there are a couple of interesting buildings, including the Stagecoach Motel and Kaibab Stone. 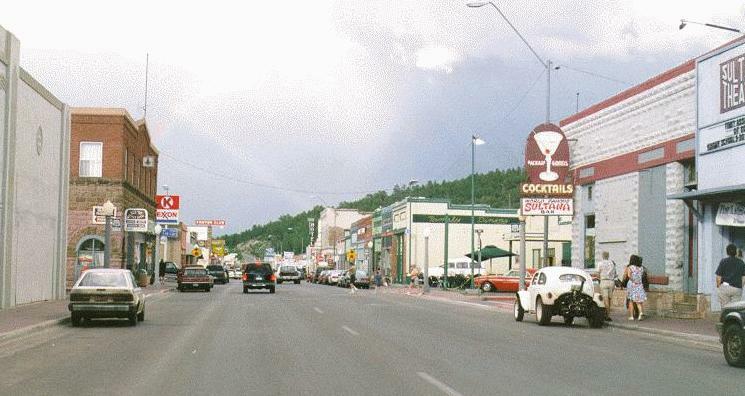 Ash Fork is the "Flagstone Capital of the World". 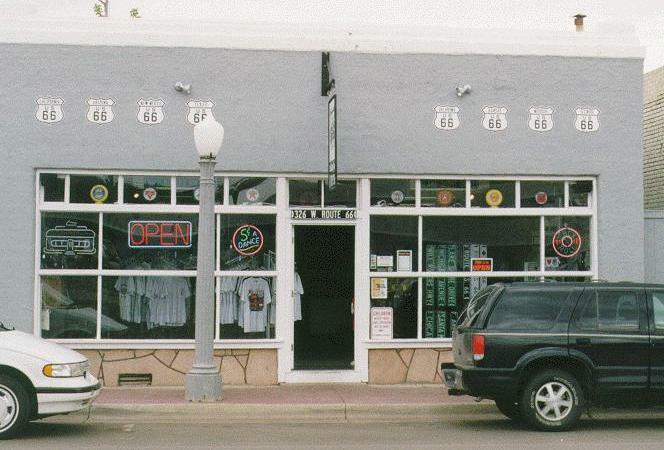 There are also some shops with Route 66 T-shirts, coffee mugs, ash-trays, etc. This is another town where old Route 66 splits, with westbound traffic running on the north side of town, eastbound traffic on the south side. You can rejoin the interstate at the end of the eastbound stretch at exit 146 or the westbound stretch at exit 144. Finding this stretch of the old road, which is still fairly smooth but is rapidly deteriorating, is easy traveling west. Take the Crookton Road exit, number 139, to reach it. 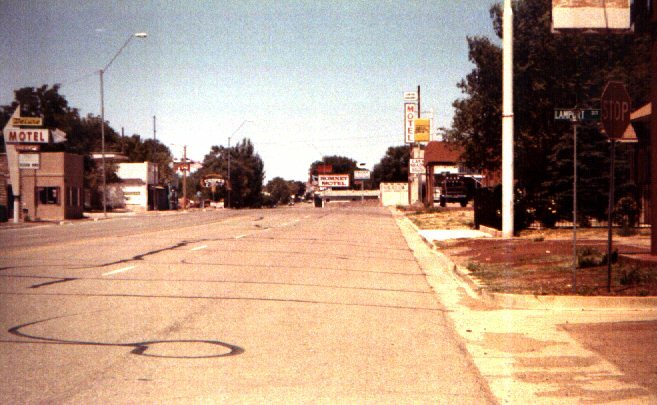 This starts the longest uninterrupted stretch of old Route 66 in existence (the longest stretch is in Oklahoma). 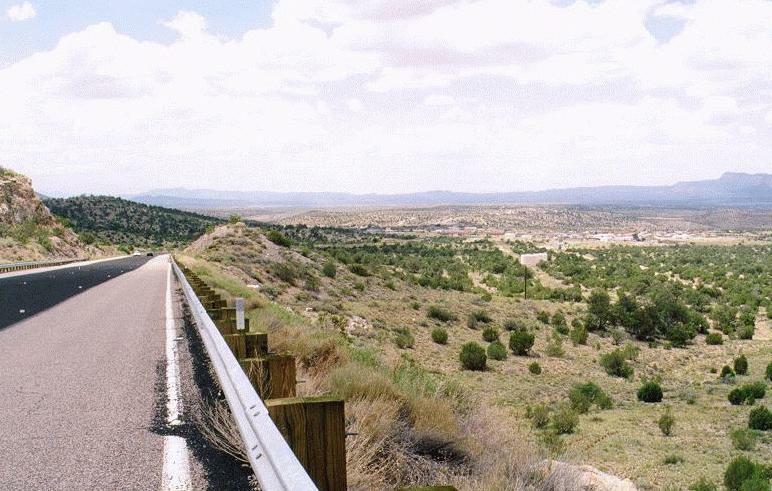 This stretch, approximately 9.6 miles in length, parallels the Santa Fe roadbed and I-40. About midway from the Crookton Road exit of I-40 the old road goes over the Santa Fe roadbed. 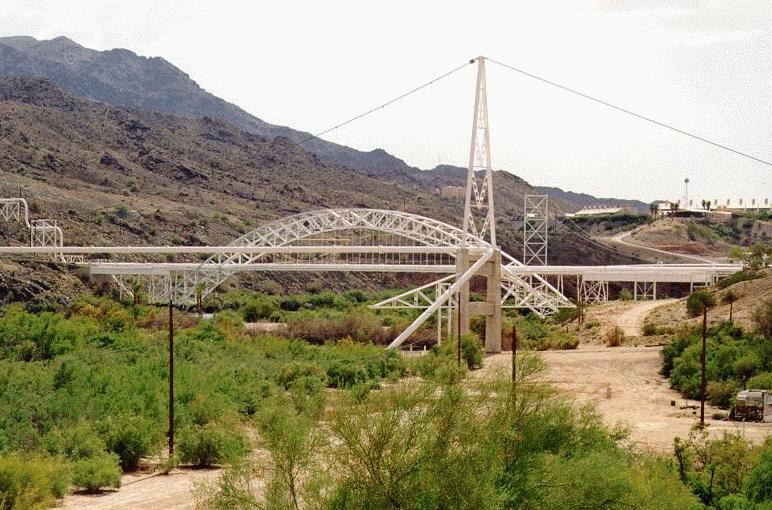 Here an older Route 66 bridge was replaced with a newer one (N 35° 17.424' W 112° 43.951' Elev 5660 feet). 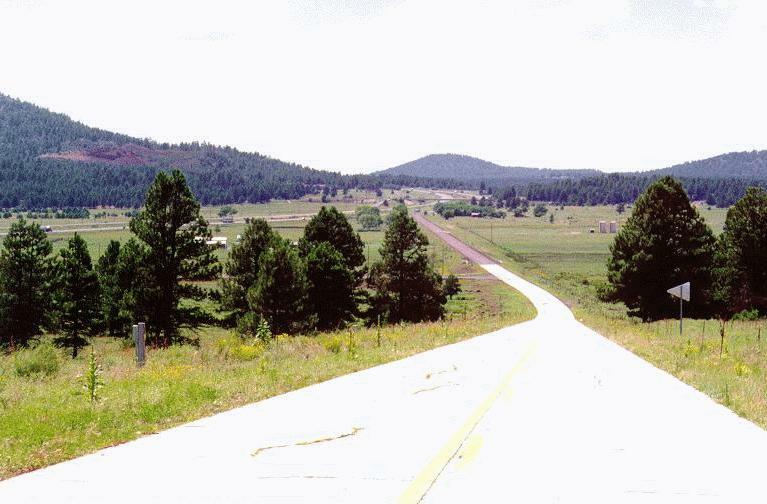 Continue west to the town of Seligman. 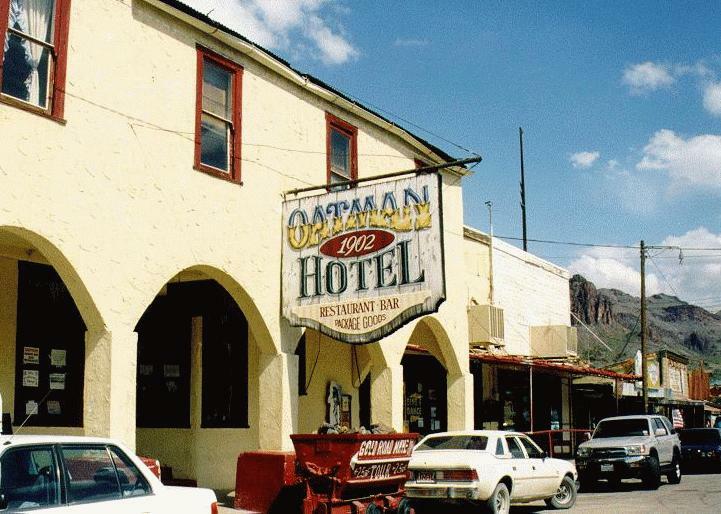 Seligman has quite a few businesses, almost all of which cater to tourists. It still has that small town flavor to it however. 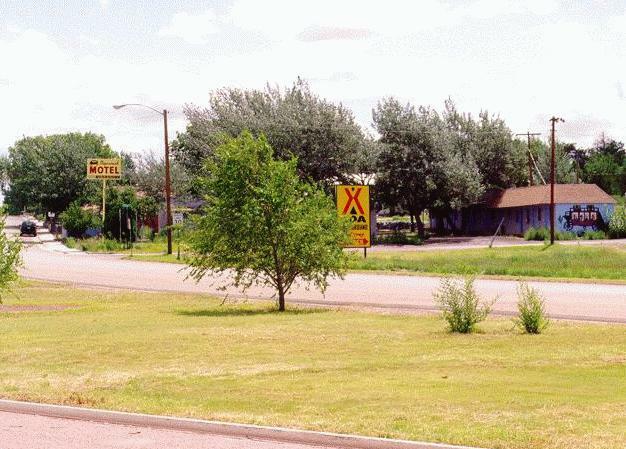 Parts of it appear as they did before the town was bypassed by Interstate 40 and Route 66 was decommisioned. This last stretch was bypassed in 1984. Stop for lunch at the Snow Cap. It is run by Juan Delgadillio, a genuine character. He will offer you his business card ("My Card"), used napkins and straws, and "dead chicken". It's all part of his zany act. The food is good by the way. 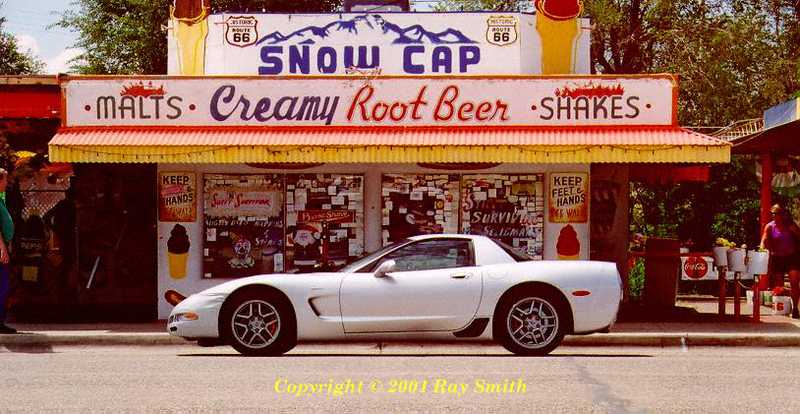 It is so good, we stopped by a few years later in our new Z06 Corvette. Juan's brother Angel Delgadillio is the town barber and president of the local Route 66 association. His barbershop stocks some neat Route 66 paraphenalia. You can chat with him and learn some fascinating details about the old road. He will tell you, for example, that during the period when traffic on the road was at its peak, the cars were literally bumper to bumper on Main Street and it sometimes took 10 minutes to cross the street. 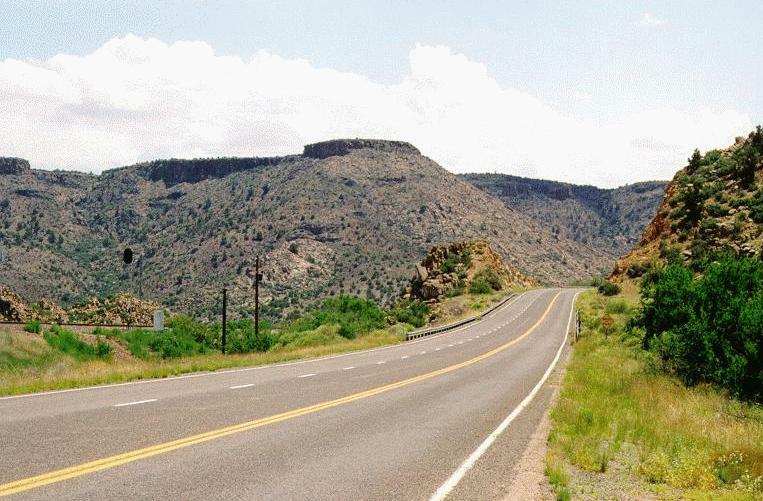 After leaving Seligman, the road curves to the northwest and runs through to beautiful and sparsely populated terrain. 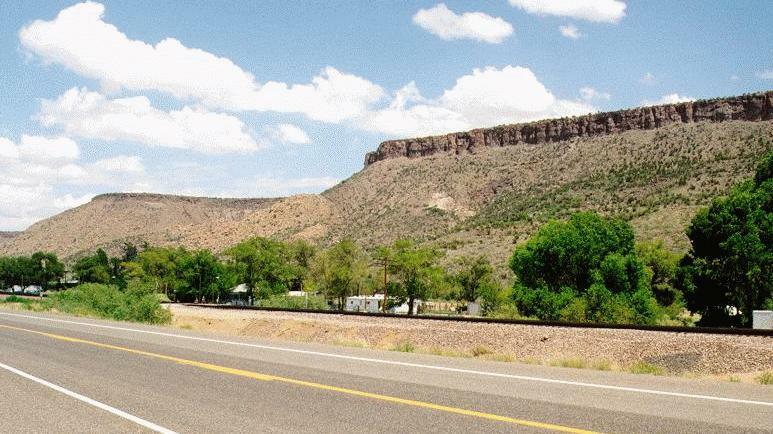 About 25 miles out of Seligman, the road suddenly expands to a four lane divided highway about a mile east of this tourist attraction. Seems to me that since the ONLY significant place here is the Grand Canyon Caverns, that perhaps pork-barrel politics was used to widen the highway here. 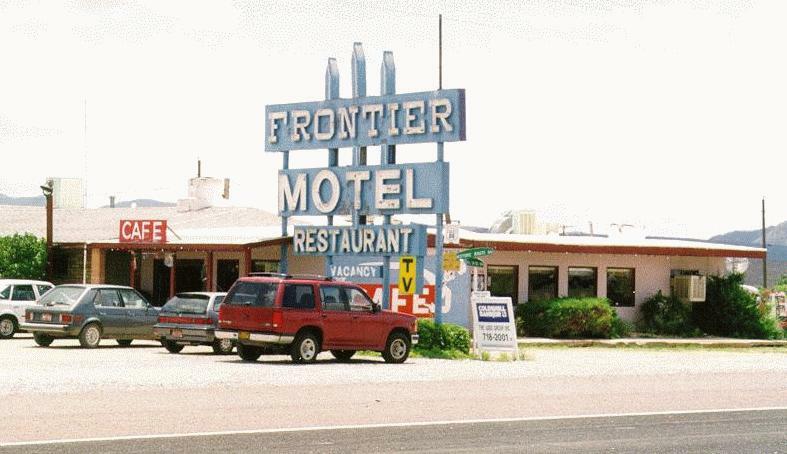 There is a motel and restaurant here, and the last time I went through here (August 1999) they were both open for business. The caverns have no connection to the Grand Canyon. They named it "Grand Canyon Caverns" to capitalize on its location near (actually some 64 miles south of) the Grand Canyon. Remember, the goal was to get people to stop, get out of their cars, and spend money. If you have the time, take the tour. An elevator takes you down into the caves, and they have a guided tour. The place was actually used to store Civil-Defense items in the 50s, 60s, and 70s (and was still in place, consuming tax dollars, in November 1980 when I last visited it). There were boxes of crackers, canned water, etc. In the lowest level of the cave are the mummified remains of a prehistoric animal, an early mountain lion or cougar. It apparently starved to death, but the mystery is how it got into the cave in the first place. The road here winds through some wide open country as it continues west. 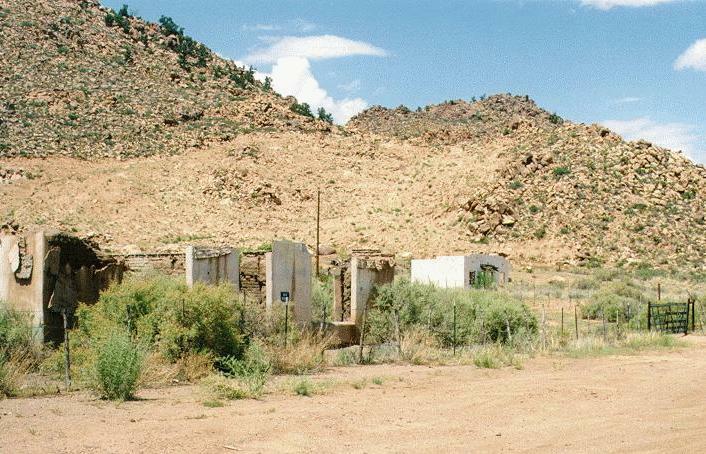 The next town is Peach Springs, headquarters for the Hualapai Indian Reservation. 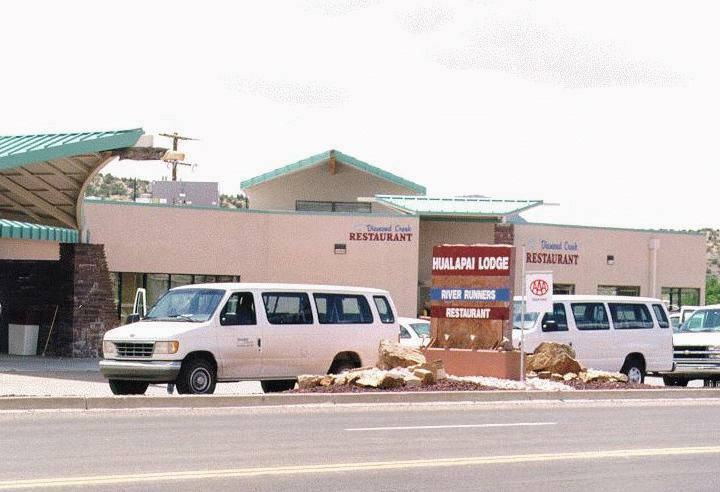 Here you will find the recently constructed Hualapai Lodge and Diamond Creek restaurant, owned and operated by the tribe. 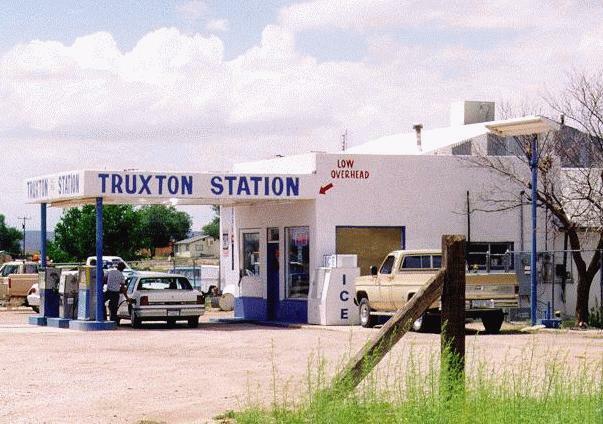 The road follows Truxton Wash, into the town of Truxton where you will encounter the Frontier Motel and the Truxton Station where you can get gas. Looking East from Truxton you can see a number of business that existed along the old road but have long since closed. Heading west you will see an older alignment of Route 66 on the south side of the road. 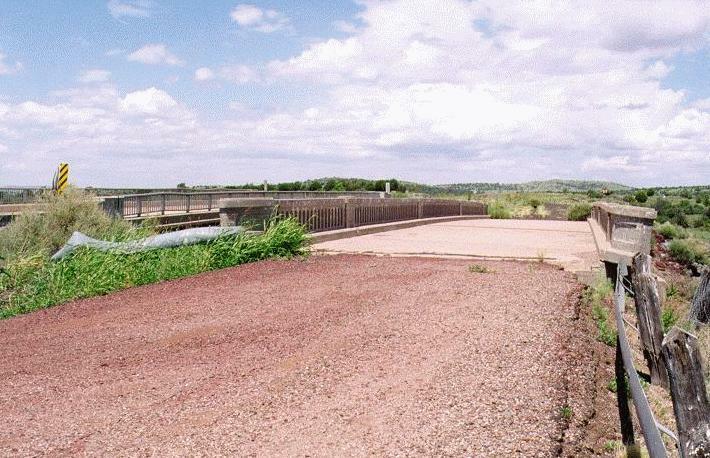 There is an Old Bridge on this alignment which is still used by the locals (N 35° 26.123' W 113° 38.785', between mile markers 89 and 88). 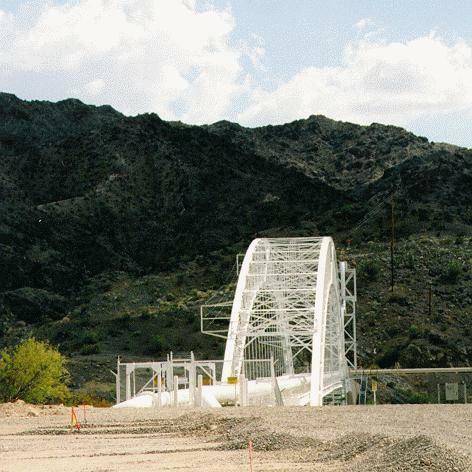 You will glimpse this bridge from the road only briefly. The road approaching Valentine parallels the Santa Fe Railroad tracks (now known as the BNSF for Burlington Northern Santa Fe), and runs beneath the Cottonwood Cliffs. There are old buildings on the east side of the town, while on the south side of the road there are occupied dwellings. 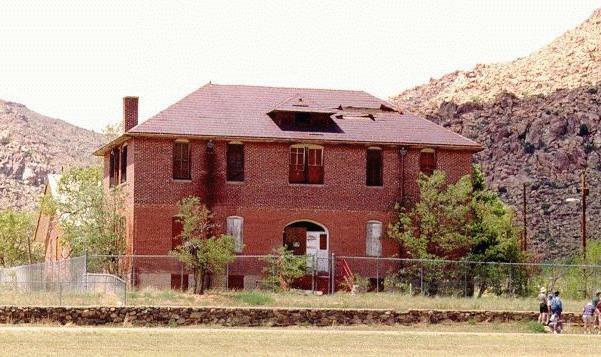 On the north side is the old Valentine Indian School which has been surrounded by a chain link fence, probably to preserve it for future restoration. The next town is Hackberry, which sprang up next to a Santa Fe siding. 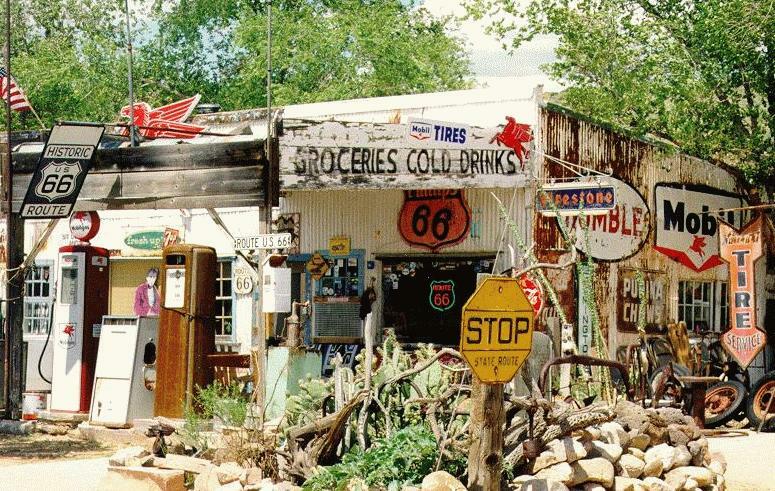 Here you will find the Hackberry General Store. The building is owned by John Pritchard, who operates the "International Bioregional Old Route 66 Preservation Foundation". The store is adorned with hundreds of pieces of memorabilia. 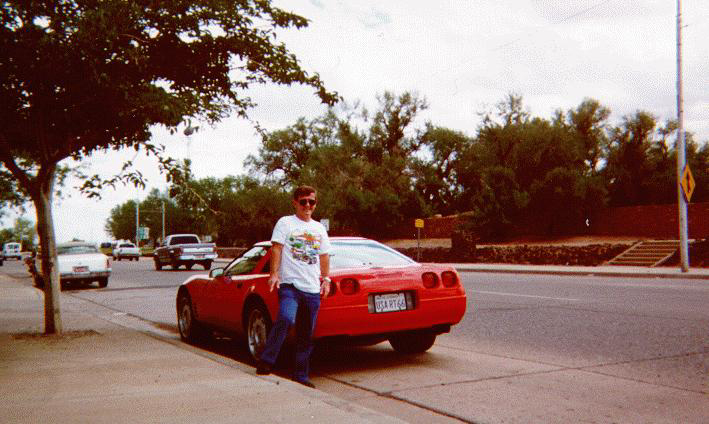 When we went back in 2001 in our Z06 he had moved the red Corvette to a different location. From here the road turns south and soon the town of Kingman is visible below. The road into Kingman widens out to a divided four-lane asphalt highway just north of Mohave County Airport (where there is a storage area for commercial airliners). It continues to run parallel to the Santa Fe roadbed. 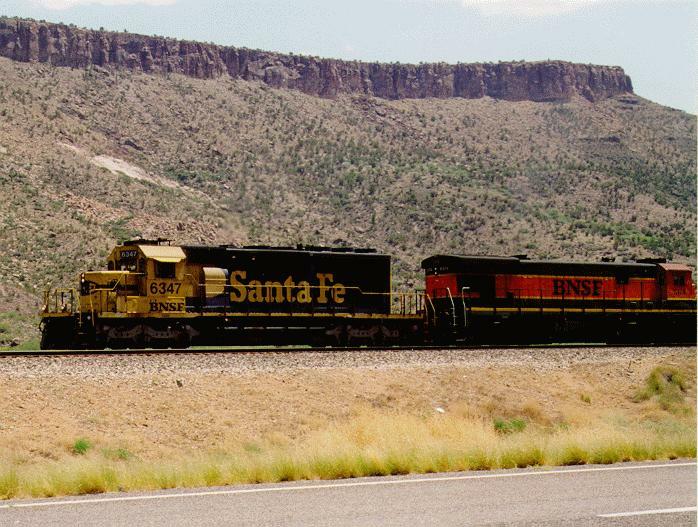 Kingman, like a lot of towns along old Route 66 owes its creation to the Santa Fe railroad more than to Route 66. Kingman was named after Lewis Kingman, the locating engineer for the railroad, the man responsible for selecting the location of the roadbed. Kingman was (and still is) a rail yard town, although fewer trains actually stop because they are diesels which do not require coal or water. The old water tanks, used to fill the tenders of steam engines, are still visible near the station which is still used by Amtrak. 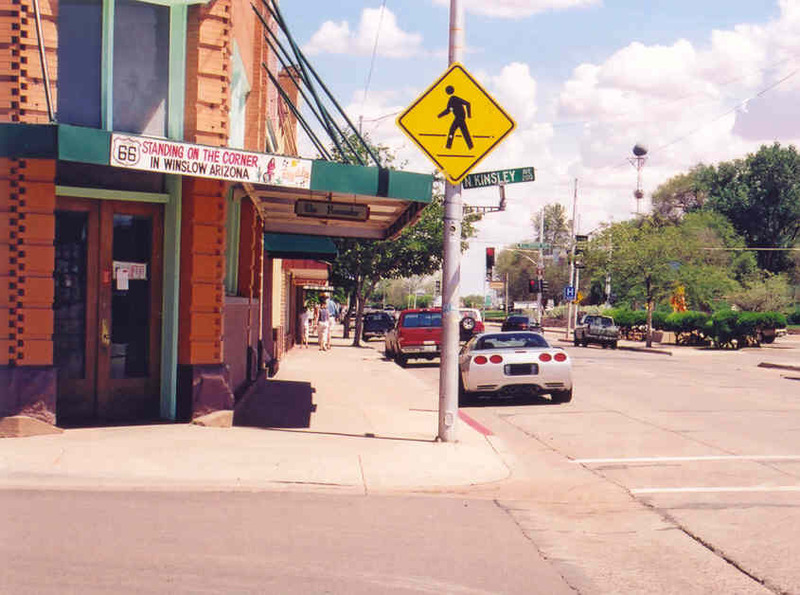 Kingman is a good place to refuel, eat, and perhaps sleep, depending on where you are in your journey. If you left Flagstaff early in the morning, and assuming you followed all of the old road to this point, it is probably late afternoon and a good time to stop. The next stretch of road is best traveled early when there is full sunlight. This stretch of the old road parallels the Santa Fe RR tracks which wind through a striking high desert gorge as it descends to rejoin I-40. Look for "Oatman Rd" signs. You will cross under I-40 to stay on the old road. 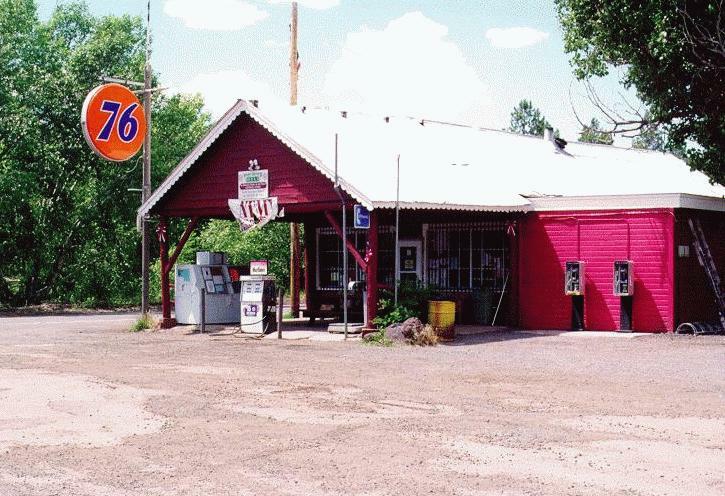 The "town" of McConnico is comprised of a wrecking yard, truck stop, and truck wash. This stretch of road is narrow and twisty. It passes by some abandoned mining equipment, relics of the period when the gold mines were in operation. 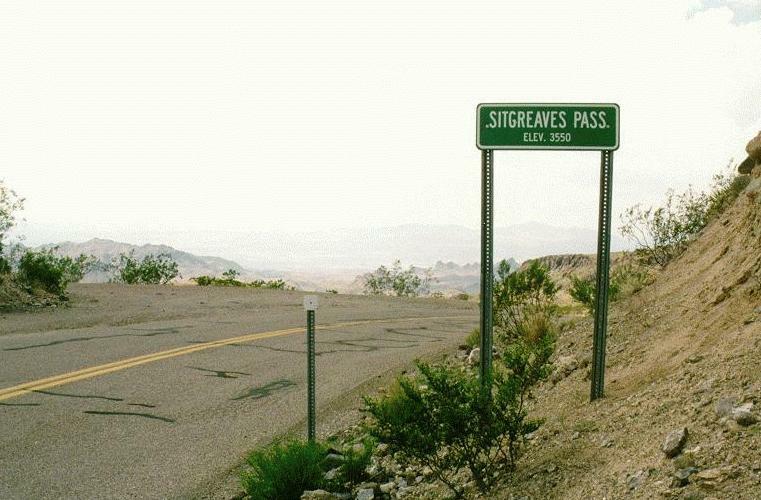 The old road goes through the Black Mountains via Sitgreaves Pass. From here you can look to the east and see the desert you just traversed. Parking is a hassle here, as the streets are narrow and not very long. Park in the first spot you find. The road from Oatman to Topock is in remarkably good condition. 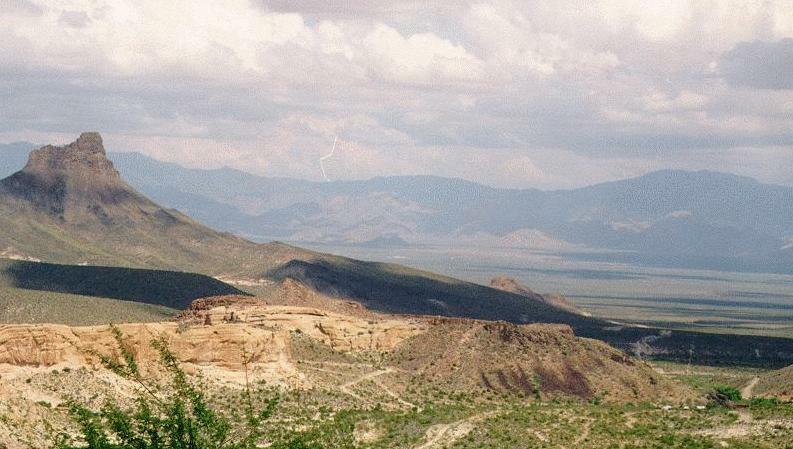 The first thing you will see leaving Oatman is the elephant's tooth, an oddly shaped outcropping of rock (extreme right of photo). Here is the same monolith from a position further south and looking back north. 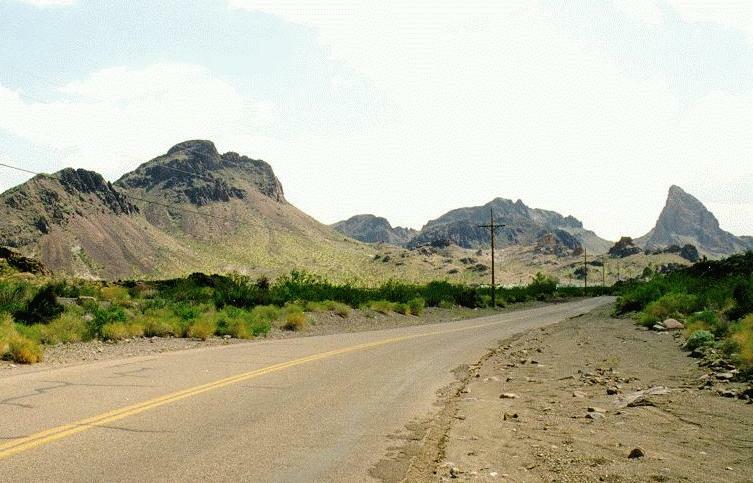 Two miles south of Oatman you will come to a "Y" in the road. 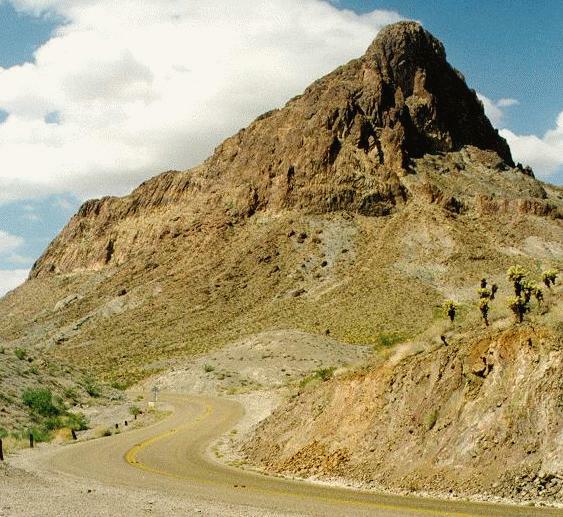 The right fork is South Oatman Road which goes to the Fort Mohave Indian Reservation. The left fork is marked "Old Highway 66 Golden Shores". Take the left fork. 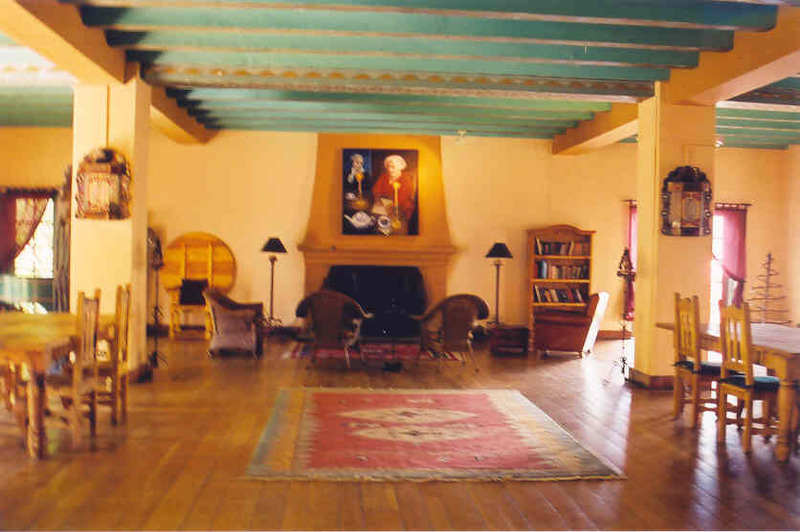 Golden Shores is a retirement community which is north of Topock. It has expanded a great deal in the last five years. After another two miles you will reach another "Y". The right fork is Boundary Cone Road. Take the left fork to stay on the old highway. There are several foreboding views of the Mojave desert to the west along this stretch at N 34° 58.441' W 114° 25.112', and the road twists and turns quite a bit as it descends to the Colorado River. There is a spot named River View on old AAA maps from where you can glimpse the Colorado River (N 34° 47.775' W 114° 28.752'). In August 1999 there were "Historic 66" road signs along the route. 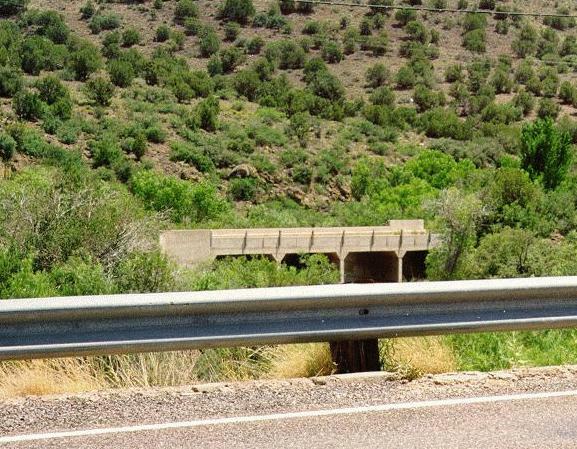 Approaching the Colorado River you will see an old bridge that used to carry vehicular traffic. It now carries pipelines across the river. You will also see the mountains that gave the town of Needles its name.